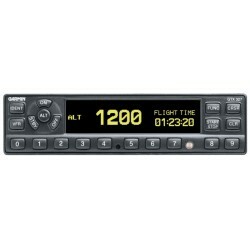 The panel-mounted GTX 327 is a TSO-certified Mode C digital transponder. Its innovative features, proven performance and reliability bring a whole new level of transponder utility to your aircraft. Looking for a more affordable alternative? The panel-mounted GTX 320A Mode C transponder features a pilot-friendly design minus the DSTN LCD display. - GTX 327 features a solid state design, and with no warm up time, lower power consumption and much lower heat emissions, you’ll enjoy a longer service life. It provides 200 watts nominal power output and has an easy-to-read DSTN liquid crystal display which reverses the numbers out of black for optimal viewing. 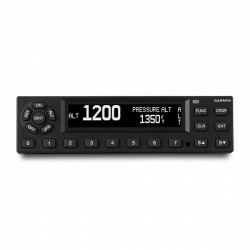 An innovative keypad makes entering a squawk code a snap, and a dedicated VFR button allows for quick-and-easy VFR squawking. Similar to the GTX 330 Mode S transponder, the 327 also offers several timing and display functions, including flight time, count-up and count-down timers, as well as current pressure altitude.